Wow, it's been a while since I added a new blog. I've been very busy with many things and really haven't had much time to devote to my little slice in the big blogger universe. I do now, have a little something interesting (hopefully) to share. I made this time lapse movie of a creating a book cover from start (well, almost start) to finish. The movie begins at a stage where I have already roughly placed some of the required elements into my Photoshop document. 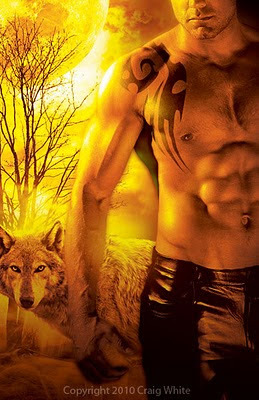 I used a stock image of a wolf and some background images I have as well as a photo of model David Kimmerle, I shot for this particular cover. The final cover is close to this, but a different color and altered slightly with revisions from the publisher, but it is essentially the same. Although it is only 10 minutes long, the movie goes pretty fast, so get your slow-mo glasses ready. I can't remember how long the actual time spent was, but I think it was about 2.5 hours. The final illustration with all revisions totaled about a day. So, if you have 10 minutes to spend and don't mind reading a few very quick captions now and again (sorry), take a look. That was really cool. Thanks for sharing! Very nice behind the curtain video. Lot's of work. You are indeed a majical person! Thanks so much for sharing just a little bit of you talents with us. We are so proud of you! wow! that was so cool. i had no idea how any of that was done. i always knew you were talented and this just confirms it! loved the model! :) and the music was great! Hi, I just stumbled upon you website, I am a freelance cover artist, and I realize some of your covers are the ones I actually admire. Just wanted to let you know. Hopefully one day I will get on with a big house as well. That is the goal anyway. Keep of the wonderful work. Good Lord, I should have previewed that comment before I hit send. I am not an idiot, just a typo- alcoholic!